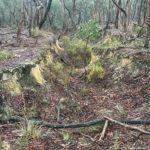 Despite intermittent showers 18 walkers enjoyed a day visiting Browns Gully and the surrounding area last Sunday, ably led by Ron Wescott. Such a good turnout shows the popularity and value of these walks. Recently the bush had been looking a bit tired and drab in the hot and dry weather but the damper conditions brought out the colours of the bush beautifully and gave it a rejuvenated look. The area of Candlebarks beside the gully looked especially good. We also visited some of the nearby stone chimneys including one used by Charlie Sanger during his wanderings. 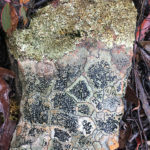 Very little was flowering but fungi had begun to emerge and lichens were displaying beautiful forms on damp stumps, dripping trunks and other substrates. 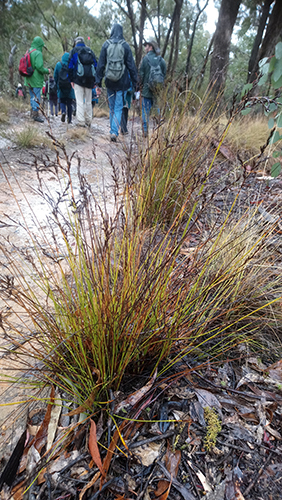 The photo (left) shows Variable Sword-sedge Lepidosperma laterale growing on the side of the track. This interesting sedge, with its large basal tuft of leaves, was found growing on drier, upper slopes. It has insignificant flowers so is not often noticed or appreciated. This hardy and drought tolerant plant is well worth considering as a garden specimen. Thanks Ron for a great walk. Dom Lavie sent us the three photos above. Click to enlarge. 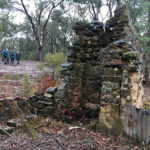 The next walk is in Poverty Gully on May 20. There was some confusion as to whether this was going ahead due to the missing lines in the printed sheet mailed out but it definitely is and all the details are on the website. Just to say I was nearly there but chickened out and then it seemed to stop raining so I missed out. Photos great. Thankyou FoBIF and Ron for leading a wonderful walk through some beautiful forest. The timely rain seemed to just enliven the bush. With so many new plants to get aquainted with, particularly the peas and wattles, it was definitely worth the trip up from Melbourne to visit and hoping to do some more walks this year. royal wedding with them on their T.V. If you can is it possible for you to contact me asap. The broadcast commences at 7 p.m. Unfortunately I live without a T.V. & also without electricity. I also don’t have my own transport.